Although there are several types of crowns, porcelain (tooth colored crown) are the most popular. They are highly durable and will last many years, but like most dental restorations, they may eventually need to be replaced. Crowns are made to match the shape, size, and color or your teeth giving you a natural, long-lasting beautiful smile. 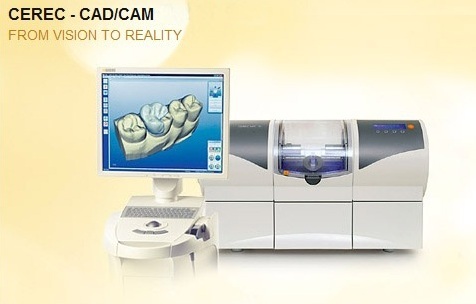 CEREC- Chairside Economical Restoration of Esthetic Ceramics, or CEramic REConstruction) is a method of CAD/CAM dentistry. CEREC is a high-tech dental device that we have here in our office. CEREC technology enables our patients to go from diagnosis to walking out of our office with a new crown in place, all in the same day! CEREC uses CAD/CAM (Computer Aided Design/Computer Aided Manufacturing) technology to fabricate your CEREC crown in just one appointment. After prepping a patient's tooth for a crown, the Doctors then use CEREC digital mapping technology to scan the inside of a patients mouth and take a computer images of their teeth. The Doctors are then able to use this detailed and accurate information to design a crown that is custom to your mouth. A new crown is then milled out of a solid ceramic block on site. After the milling/grinding process, we are able to bond/cement your new crown to your tooth in one dental visit!